RIO DE JANEIRO (AP) — Samba competition is taking on a political edge in Brazil, with one of Rio’s top samba schools and other groups paying tribute to Marielle Franco, an activist for gays and Afro-Brazilian rights who was slain almost a year ago. Mangueira, one of the oldest samba schools in Rio, included the former city councilwoman in its parade early Tuesday honoring Brazil’s hidden heroes, those who history books often forget or choose not to mention. Franco and her driver, Anderson Gomes, were shot to death in their car while driving in downtown Rio on March 14, 2018. The killings shocked Brazilians and set off a wave of national demonstrations, but police have never named suspects. Several flags with Franco’s face in green and pink, the Mangueira colors, appeared both in the parade and on the stands. One giant green flag on the stands also with Franco’s face seemed to send a message to far-right Brazilian President Jair Bolsonaro, who won last year’s elections with a pro-gun message. “Our weapon is education,” the flag in tribute to Franco read. “Marielle was a woman, a fighter, from the favela, who overcame inequality, went to university, was elected councilwoman, fought for minorities, denounced and investigated public power,” said Deivid Domenico, who co-wrote Mangueira’s samba anthem for this year’s Carnival. For the composer, the need to write about the slain councilwoman and Brazil’s forgotten history was all the more important this year as Brazilians recently elected a far-right president who has repeatedly praised the 1964-1985 dictatorship. Franco grew up in Rio’s Mare favela and was black and homosexual – a rarity in Brazil’s overwhelmingly white and male political spectrum. While progressives hail Franco as a hero, Rio state lawmaker Rodrigo Amorim, who last year showed off a street sign honoring Franco that he and another candidate had broken, told the newspaper O Globo that he was disappointed the samba school included the councilwoman in its parade. “Just as universities are absolutely dominated by this cultural dictatorship that the left is trying to impose, unfortunately it has also reached the samba school,” said Amorim, who belongs to Bolsonaro’s PSL party. During the parade at the sambadrome, Amorim told journalists he was not singing Mangueira’s samba despite being a supporter because he couldn’t memorize the lyrics. 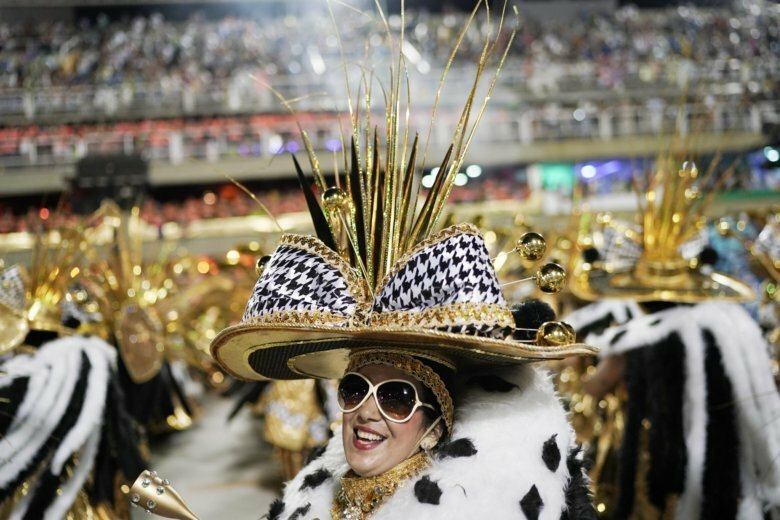 Thousands of revelers in the stands, however, found Mangueira’s tune very easy to sing and favored the green and pink samba school to win this year’s parade. “This is the champion,” they chanted after Mangueira’s performance. Standing outside a Rio subway station with a sign reading “Who killed Marielle?,” Adelaide Rezende argued that Brazilians needed to keep up the pressure. “If we don’t forget and keep asking, we might get some answers,” Rezende said, noting that authorities have said they believe the killing was orchestrated by militias, paramilitary-type groups that have close ties to local politicians. Benicio, Franco’s partner, attended a bloco in Rio wearing a shirt reading “Who killed Marielle?” She also carried a rainbow flag around the Toco-Xona bloco with the face of the murdered councilwoman. The Ilu Oba de Min bloco in Sao Paulo, which promotes Afro-Brazilian culture, also remembered the councilwoman. “They are not going to silence us!” the female-only bloco sang Sunday. At Sao Paulo’s Vai Quem Quer bloco, 3,000 people danced as street signs with Franco’s name rose close to the speakers. Rodrigo Rodrigues, an internet technology student who was one of the revelers, said the bow to Franco comes from her example and from her being a symbol of resistance to the new president.